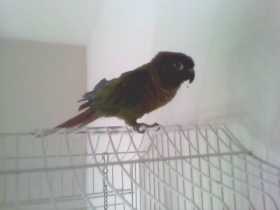 Sassy is a normal colored Green Cheek Conure that went missing a few weeks ago when she disappeared from the bird room. We had the door to the room open for a little while and went in and out of the house and we think she may have possibly flown out when we weren't looking. We think she's a female but we are not positive on her gender.